There’s a wonderful, ironic comic strip by Mike Adams that really illustrates the interesting dilemma between wasting food and overeating. One way this plays out is by guilting people into eating more than they should. In China, meals are organized in such a way that there is less chance for overeating. 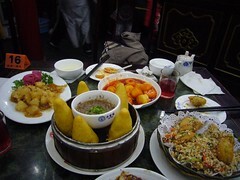 In a typical Chinese meal, each person has his own individual bowl of soup or rice, and all of the main dishes like vegetables and meat are at the center of the table. Everyone has chopsticks to take some food from the shared plates. In more formal dinners, there are public chopsticks to eliminate the fear of contaminating shared plates with germs. This type of sharing food is useful because it encourages you to eat as much or as little as you want. There is no need to “finish your plate.” It also allows people to save all of the food later, without scraping leftovers from someone else’s plate. One food wasting problem I saw in China is that people order more food than the group could possibly eat so as to appear generous. In China, the concept of “giving face” requires that guests are well taken care of and well fed. This unfortunately leads to ordering way too much food, creating a lot of leftovers. Restaurant leftovers might not seem so bad, but I noticed that most people were not interested in packing up the leftovers and bringing them home. I asked some locals about this phenomenon and I found out that more and more people are realizing the gravity of so much wasted food. They told me that a few years ago no one even considered bringing leftovers home from the restaurant. Things are certainly changing, especially as people realize how much energy is spent bringing them this wasted food. While I was staying with family friends in China I noticed how well planned each home cooked meal was. Not only do Chinese people tend to buy only their food for the next day or two, but their whole kitchen is organized around fresh food and finishing what you prepare.I was surprised to find that this household had a very small refrigerator, which was only used to store leftovers from one day to the next. The family I was staying with went out to shop for vegetables, fruit, and meat every single day. They planned meticulously what they made for each meal. Interestingly enough, the markets in China allow you to buy as little of each ingredient as you want. You don’t need to buy a 12 pack of anything, and you can buy a piece of meat the size of a coin and no one will look at you funny. The same goes for buying a few stalks of green leafy vegetables. Looking back, I’m really grateful for learning about the way Chinese people eat, and their food saving strategies. I think we can learn a lot from the Chinese way of eating. I especially like the idea of sharing food via central plates, because it allows you to eat as much or as little as you want. I think it’s a great way to venture out and try different foods too. I’d love to know what you think about my observations about food wasting and saving in China. Feel free to leave a comment here or get in touch with me via my site, Raw Foods Witch. This entry was posted in Guest Posts, International. Bookmark the permalink. Both comments and trackbacks are currently closed. Huh. I don’t know quite what to make of this. It sounds as though, comparatively, it’s a bit of a wash as to which of us has got it right. It seems like any social construct around food can lead to greater or lesser waste. It’s almost as though there’s no situation that’s more or less likely to diminish food waste . . . unless the garbage can like, screamed at you when you put food waste in it. Now THAT would be something new. I can definitely see where buying food for just that day would reduce food waste. Unfortunately, that would be an enormous amount of work for me because I have four kids to take with me every time I shop. It also seems like that would be sort of a waste of gas too. @Dan You’re right, it’s kind of hard to tell which of us is doing better. But I don’t think we should try to compare so much in terms of all or nothing, instead we might try to learn from each other. I know Chinese people are starting to take food home from restaurants, like we do here, so it’s working. @Kristen I totally understand! Since I came back from China, I’ve been trying to buy enough food for just a few days. When you shop here you need to buy bigger portions because they come packaged that way or are cheaper that way. I still think that it’s a good idea, and I try to practice it as much as I can. But I understand it’s not the most feasible. Old China Hand WilliamB here. Well, maybe not ancient, and my China Hand days are probably behind me, but I did live & work there before doing so was trendy, have touristed a half dozen times, been to most of the provinces, and at once point spoke pretty good Mandarin. Certainly good enough for me to have conversations with the locals about their lives. Don’t romanticize the typical Chinese shopping pattern. Shopping every day, in whatever culture, is usually a sign of poverty. Doing so takes a lot of time and is usually a response to lack of storage space, lack of storage facilities (like a pantry or fridge), and lack of ready cash. In many cultures it also costs more because one can’t buy in bulk, or buy and store when things are cheap. Planning meticulously and shopping every day are also enormous time sinks. And guess who does most of the planning and shopping? Women, of course, and in China most women have day jobs as well. The Second Shift is not just a Western phenomenon. I’m not disagreeing with the facts you present: family style is the norm and it does lead to less waste, or at least less wasted on the individual’s plate. What you describe at restaurants and banquets is typical. Far more Chinese families have a TV than fridge. But please, don’t view poverty-induced habits through rose-colored glasses. And that cartoon is great! Interesing question. I’m not doubting Chinese poverty, but I had a different reaction to Nathalie’s description of Chinese shopping. To me, the idea of daily food purchases conjures visions of Alice Waters prancing through Parisian patisseries and green markets. It is time-consuming, for sure, but the market/store may be very close to where we live. Also, it’s no given that bulk buying saves money. When you factor in how much of bulk purchases don’t get used, it may be more cost-effective to just buy what you need. That way surely means less waste. What was Nathalie’s take on it? I went to the market with them many times, and I know that buying “only what they need” is not because they are poor. In fact, they sometimes overbought food to “give face” but they knew we weren’t going to be able to finish it. To be perfectly honest, at least in the parts of China that I visited, buying food daily or every 2 days was not because of poverty. The real poor are the farmers, or those who live outside the cities. I can’t comment on them much because I didn’t spend enough time in those regions to get a good understanding. Thanks again William! I do think that women in China work very hard, and the same goes for men. It’s a very hard working nation, and their lives have not been easy. Nathalie, now you have my curisity going. What cities did you stay in? Which neighborhood(s)? Did you get to spend time with the couple’s family or friends? Did they cook for you (lucky you!)? What did the couple buy daily and what did they buy in bulk? Did they have anything to say about youth these days? What are their thoughts about street markets vs “supermarkets”? I miss China. I haven’t been in about a decade, far overdue for a trip! My last trip included more large cities than small ones, and I was surprised, and disappointed – to see the demise of street food. My favorite block of stalls had been removed to make room for an indoor strip mall. It was hard to buy breakfast on the street, although the few experiences I did have were a hoot as they usually included either a police raid or a police pay-off. There were a *lot* of small restaurants, also a new thing. Street produce markets still thrived but they tended to be fewer and larger than before. Bringing this back to topic, what I don’t remember from my trips is how much food waste I saw. I was a tourist and I lived in a hotel, neither of which is a great way to see how the Chinese live at home. When I did visit a home, it was An Event and I was The Western Guest; not a typical situation. I was able to have typical breakfasts of rice porridge (congee) with savory and/or spicy toppings. The toppings could easily be leftovers. There’s a common lunch which is built around leftover fried dough sticks (youtiao). And, of course, there’s the venerable fried rice, the leftover casserole of the Chinese world. I visited cities like Beijing, Xi’An, GuiLin, and Guangzhou. Though I spent over a month in a suburb of Guangzhou (Panyu) with the couple I mentioned. Yes, I did spend time with their family and friends. Most big family/friends gatherings took place at restaurants though. They had rice delivered in bulk. They bought vegetables, and meat in small quantities. They bought fruit in small quantities too, but I eat a lot of fruit so I usually bought more. Dragon fruit, star fruit, and super fresh clementines! I couldn’t pass those up. William, you should definitely schedule a trip to China, it does seem that things are changing really fast though. I especially think big cities are becoming Westernized at an alarming rate. It’s not just the McDonalds, but there are KFCs, Pizza Huts, Starbucks, etc. Not to mention all the clothing stores too. Hope this satisfies your curiosity a little. I lived there first half of my life. Food wastage was rampant, and I never could fathom why. Grinding poverty may be the only cure, which speaks volumes about how humanity stinks. William, I disagree that shopping every day is a “poverty induced” habit. I live in Hong Kong and can fortunately say we are not in poverty. It’s called fresh ingredients, instead of frozen microwave foods. Not everyone lives in a country where you need to drive to buy food, which means you need to buy in bulk.